There are few things more soothing than warm stuffing out of the gutted sternum of a turkey. 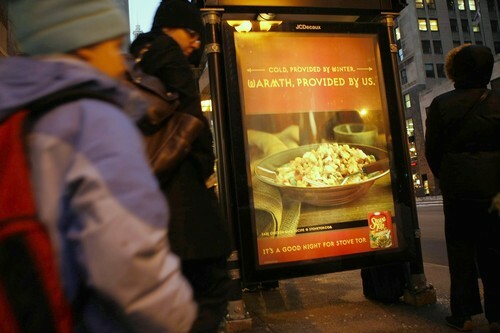 And with help from JCDecaux, this soothingest of comfort food is warming bus patrons at 10 bus shelters in Chicago. The Stove Top ads -- radiant with warmth -- feature a heaping bowl of stuffing, tossed and tasty looking and beckoning hungry passengers home. "Cold, provided by winter," the ad reads. "Warmth, provided by us. It's a good night for Stove Top." Find stuffing-hot bus shelters in the Chi through December. Reps will also be handing out (steaming?) samples. Work by DraftFCB.